Brewer, David, and Barry Kent MacKay. Wrens, Dippers and Thrashers. London: Christopher Helm; and New Haven: Yale University Press, 2001. Cramp, S. Handbook of the Birds of Europe and North Africa; Birds of the Western Palaearctic. Vol. 5. Oxford: Oxford University Press, 1988. Kingery, H. E. "American Dipper (Cinclus mexicanus)." In The Birds of North America, edited by A. Poole and F. Gill. No. 229. Philadelphia: The Academy of Natural Sciences; and Washington, DC: The American Ornithologists' Union, 1996. Tyler, S. J., and S. J. Ormerod. The Dippers. London: T and A. D. Poyser, 1994. Salvador, S., S. Narosky, and R. Fraga. "First description of the nest and eggs of the Rufous-throated Dipper Cinclus schulzi in northwestern Argentina." Gerfaut 76 (1986): 63-66. Skutch, A. F. Studies of Tropical American Birds. Publications of the Nuttall Ornithological Society. 10 (1972). Tyler, S. J. "The Yungas of Argentina; in search of Rufous-throated Dippers (Cinclus schulzi)." Cotinga 2 (1994): 38-41. Tyler, S. J., and L. Tyler. "The Rufous-throated Dipper (Cinclus schulzi) on rivers in north-west Argentina and southern Bolivia." 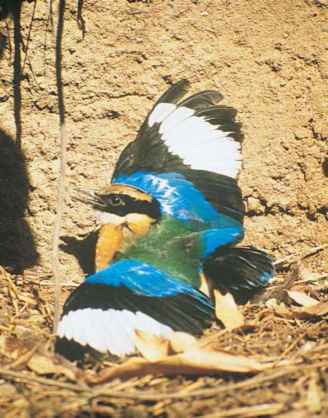 Bird Conservation International 6 (1996): 103-116.